This is one of the reasons I love working on my house. I bought a nice, perfectly fine house for a reasonable price. But I saw potential, and what I could make of it if I applied myself. It's taking shape, and is already SO much better than it was. And I'm only 2 years into it. With my mind and my hands, I'm "making something from almost nothing". I'm solving problems, coming up with creative solutions, making my family's life better, and increasing the value of our investment. Howard Roark loved to work in the granite quarries, or on a construction job working with his hands. I think this is why. It's the meeting of ideas and physical exertion, dedicated toward greater values. I'm exhausted right now -- still! -- but I love it. So this topic isn't related to the study of Objectivism, but it is an expression of a fulfilling, value-driven, rational life. I know I'm waxing poetic about ripping up floorboards or patching grout, but dammit, there is nothing better than spending a month of weekends doing something like this, and then watching your kids playing on a patio you fixed, and then pulling your perfectly clean car out of your garage. "I think they created that demand," says Roush. "If you go back to the 1960s, 1970s, if you wanted repairs done on your home, you were hiring the local carpenter or the local electrician to come do that work on your house. And what they've created is this psyche that, hey, this kind of stuff is easy to do." And so [Home Depot] makes a profit and you spend your money. Still, Roush says, the tangible benefit to the homeowner enhances the popularity of obsessive remodeling. I would expand on this and say that pre-Home Depot, the homeowner with a cracked wall or inefficient use of space may have wanted to fix the problems, but the materials were likely harder to find and more expensive, and the knowledge to do it wasn't as pervasive. On top of that, I would be surprised if contractors -- the "local carpenter" type from Roush's quote -- of the good old days were any more reliable, qualified, or affordable than those today. Now the average homeowner can watch HGTV, then take a short trip to the big orange store, and tackle the project himself. He doesn't have to pay for labor, he can customize everything to his own tastes, and in the end he can feel the pride of accomplishing a goal. It's a win win win situation! On top of that, a side benefit to all of this is the wicked delight I get when I think about all the work people are doing on their homes without getting a permit. What the Home Depot revolution has done is give Americans back part of their heritage, hearkening back to more independent times, when one could build a house on his own land, with his own hands, and not have to grovel to a zoning board for permits, or beg for a positive outcome from a community comment session. 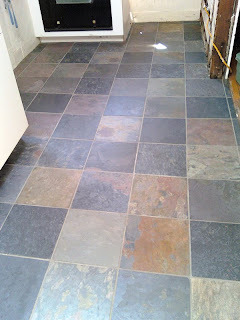 And because this post wouldn't be complete without a real-life example, I present the finished slate floor in my kitchen! Well said and thanks for the history. I agree with your final analysis. We've been thinking about the next housing step (space and place) and exploring the possibility of including a whole bunch of self-sufficient activities. The crossroads (should we stay or should we go) looms near (3-4 years). I've got three posts started about it, but in the end have posted other, less important things. "[M]olding our environment to suit our needs and wants" is a huge part of enjoying life in my book (notice: molding, not cleaning). Thanks, LB. We just moved about 3 years ago, so I don't even want to think about doing it again any time soon. We bought our house with a 20-year (or more) plan in mind, so we can take the long view with our projects. I can see if you're thinking of moving in a few years, that might change the goal of your projects. More to the "how do we increase the resale value and make the house more showable at the lowest expense and inconvenience?" side of the equation. That's what I'd do, anyway. You've said that you like modern houses, so is that what you're thinking about? Buying some property out in western Mass and building a place? By using 40-odd tons of material and your own hands (and back), you and one friend transformed an unusable slope covered with scraggly plants and mostly dirt, into a fantastic and flat grassy playland. After completing The Wall, you dug out - sometimes from nearly complete rock - all of the fence posts and installed the lovely wooden fence that keeps us safe, provides privacy, and allows our dogs to run and play without leashes. You transformed a crappy old bathroom with a black Formica sink cabinet into a spa-like bathroom with a marble sink and Craftsman style cabinet. You also removed part of the wall from the room to make it more spacious, and replaced the toilet with a nice, new, "old-fashioned looking" toilet. And you got rid of those awful "appearing now on Broadway" dressing room lights. Wow! You ripped down walls, reconfigured the "habit trail" that was our upstairs hallway, rebuilt the linen closet, flipped doors around so they opened properly, removed disgusting, worn and dirty carpeting and put down a gorgeous new floor. Oy! The wallpaper in this house was so horrific! You steamed it all off and repaired the walls underneath, leaving us with bright spaces and a clean slate to decorate and make the house our own. Again, you took down a wall to allow us to maximize the space in our 21x6 kitchen with limited counter and cabinets. By installing an island cabinet with a breakfast bar between the kitchen and dining room, we now have a space that invites conversation and allows me to cook/clean while the kids are at the table - doing arts & crafts, having meals, practicing writing, etc. Oh stop, you're making me blush. Well, now I will expect before and after photographs of all the mentioned projects as part of your new series of posts - Home Improvement Superhero! Able to nail a 16 penny green vinyl sinker in one blow, stronger and faster than Quikrete - it's HIM - Home Improvement Man! Yes, modern; no, Massachusetts. In one respect, I feel like we're giving up; in another respect, I feel like we've got to get the hell out of here! We're just not sure where to go. I can't believe that's the same kitchen floor that I saw before. The same one that looked like a crappy attempt at someone trying to do an Escher painting, with different types of wood pointing in all kinds of directions, most of them wrong. Oh, and Mrs. C -- there was also the small matter of putting a jack in the basement to support the weight of the entire house, because it was sagging over the support of an oak post, then replacing said post with a proper concrete/metal support. Now THAT'S a project that I would not even have remotely considered doing myself. We would have spent big bucks on a contractor for that one (and probably not have received as good a result). Again, C -- well done! Your post is inspiring me to do more stuff around my own house. And to be honest, jacking up the main carrier beam of the house and installing a new lally column was one of the easiest jobs I've done. It just sounds scary and intimidating. But really, once you get the jack in there (a $30 bottle jack from Home Depot that can take a 20 ton load) all you do is raise the house 1/8-1/4" a day. It's not much effort. And since I did that, doors on the 1st and 2nd floor that never fully opened or closed suddenly worked!